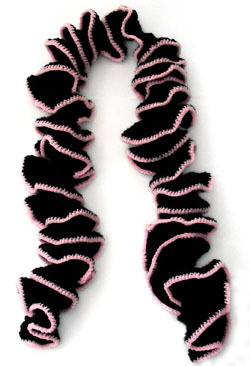 This ruffle scarf is very simple and easy to crochet. All you need to do is make a nice long chain that is approximately the length of the scarf and keep doubling the number of crochet stitches on each row of the scarf. You can even alternate colors or add a small edging for the last row to make a nifty style. Make a bold fashion statement with this fun and vibrant crocheted scarf. Row 5: change to contrasting color, ch 1, turn, sc in each tr across, finish off. For a thinner scarf, simply make fewer rows that indicated in the pattern. For a shorter scarf, make less chains to start row 1. If you need help with this pattern, just leave a comment! This entry was posted on Tuesday, March 3rd, 2009 at 11:52 AM by Rachel Choi	and is filed under Free Crochet Patterns. You can follow any responses to this entry through the RSS 2.0 feed. You can leave a response, or trackback from your own site. Thank you for your prompt response. I will be attempting this today. I thought I should go under the “v” shaped stitch but it was not curling so I stopped to ask. I will continue on and let you know if I have anymore questions. I appreciate your help. Enjoy your day! I just want to make sure I understand. I am going right under the first “v” and doing 2 tr in every one of those correct? There seems to be a thread right under the “v” and I am wondering if I should be including that? Also should I have skipped the very first “v” or no? When should I start to notice it the ruffles? I am sorry for all the questions but I want this to turn out correctly. Sorry for all the post but I am about half way through the 2nd row and it is curling nicely. Thanks again for all your help! Hi Shay, yes only go under the “v” shape on top (front and back loop). I’m glad you’re starting to see it curl. Is there a spot where I can ask general crochet questions not relating to this particular pattern? I have a question about hook sizes and using two different colors at one time. Hi Maggie, sure give it a try! Maybe you can crochet a little square and sew the sides and bottom of it to the scarf to create the pocket. Can I just check whether you are using US or UK abbreviations? I looked up tr stitch and its different depending on where the website is based. Hi Caroline, the abbreviations on Crochet Spot are all in U.S.
Hi Arielle, I used approximately 300 yards. It’s probably isn’t a one skein scarf pattern (unless you have a really large skein of yarn). There are other scarf patterns on the site. Feel free to use the search box at the top of the page and type in “scarf”. I haven’t begun the scarf yet but in readng the instuctions I find I have a question already. When do you incorporate the contrasting color yarn and how much would I need to purchase? KC, you don’t need much. A 50 yard ball of yarn should be plenty. I am so excited! I found this pattern, and did a small trial run to see if I could do it… and it turned out great!! I can’t wait to go get some pretty yarn for this and make some for Christmas gifts! Thank you for the fabulous directions!! I recently finished my scarf and it is so pretty but I realize that it is much too long..I saw a post on here where someone said they had the same problem and they “cut” it in half and sewed it back up…can someone please tell me how to do that? hi, I am going to have a go at making this now. I have a few friends coming round for a Crafty Afternoon and I think this will be great to get the beginners start with. Sue, the instruction are all written in the U.S. abbreviations. Wow wow looks good .i will start today.i am so glad to have found yr site as it inspires me ever so often and your new ideas keep me going.wish all those yarns were available in India too! Hi. When and how do I incorporate the contrasting trim color? I’m a beginner so be may not be understanding something that is very simple. Thanks. this is adorable. MR, before you do the last row of the scarf, change to your trim color so that the last row will be in that color. Thank you!!! this is so cute. Can’t wait to finish. Not sure I follow Row 1. “tr in third ch from hook and in each row ch across”. What do you do in the first row? tr in each ch? 2 tr in each ch? NJD, you’re going to make your first tr in the third chain from your hook. If you count the chains, starting from the closest one to your hook, the third one is the one that you’re going to make your first tr stitch in. Then, you are going to make one tr stitch in each of the remaining chains. Im using varigted yarn for this pattern and having trouble! I dont know what or how do do a treble crochet so Im just doing a double crochet instead. But it doesn’t look right to me. Im having trouble being that my yarn is verigated and is “spiraly” its hard to see my chains. Any hints or help? As for the variegated yarn, it can be tricky to see the stitches. I’d recommend either using a different colored yarn or practice more with the variegated until you get the hang of it. The more you practice the easier it gets! Have you tried this scarf with any other stitches? I was wondering if you can make it with double crochets. Hi Leah, I’ve crocheted similar scarves in other stitches, like double crochet. You should be able to crochet this scarf with double crochet too. Your finished Scarf will be a little more narrow than the one in the photo. I seems to be using way more than the 300 yards mentioned in the pattern and I can’t figure out why. This is my first real project where the amount of yarn has mattered, so I’m not sure if this is normal… am I doing something wrong? Hi Angela, I did crochet pretty tight when I made mine, so that might be why I used less yarn. I wouldn’t worry about it too much though, since gauge isn’t that important for this pattern. I finally decided to use your pattern after testing a few ruffle patterns. I just have one question. I’m not a fan of the treble stitch. would this work with a double stitch instead? i would probably do an extra row before the finishing row to get the same width. PS, i can’t wait to start (and finish) this scarf. It looks perfect for both winter and accessory wear. Abby, yes you can try doing it with the double crochet stitch. Have fun! I LOVE this scarf. I am almost finished with it and it is really fun. Thanks for the great pattern. Super simple and easy to understand! I’m confused w/ the first row directions for the ruffle scarf. After I chain 203, I triple crochet in the 3rd ch from the hook – i got that part. then you say “and in each row, chain across”. i dont know what that means – there is only 1 row – the chain we just did. ?? help. I just saw that someone had the same question that I did – so that was answered. I’m making this right now and it is so cute! It is also relatively quick and east to make. Thank you for posting! I am about one third of the way done with my fourth row. I used a 355yd skein of yarn from Hobby Lobby, but I am getting worried that I will run out before I complete the last row. Could I switch to a dc on the fourth row instead of the tr, if I find out I don’t have enough yarn to do tr on the fourth row? Thanks!! Hi Robyn, sure you can switch to double crochet stitches instead. It’ll turn out slightly more narrow, but the difference should be barely noticeable. Have fun with it! Thanks!! It’s looking great so far!! I’ve tried crocheting before and was not very successful. Your web site is just what I needed. Thank you! Hi! Maybe one of you can help me/offer some advice? I’m trying to make this, but I’m having trouble making the ruffles. I have really nice curls at the start of my 2nd row, goes flat in the middle and then kind of cures again at the end, the more rows I add, the less defined the curls get. I’m double checking and I am putting 2trc in each stitch. Does this pattern have as many curls as shown in the picture? Do the curls alternate directions or is it a spiral all the way through? Hi Angie, the pattern is for what is pictured. Depending on how you lay or hold the scarf it can look differently though. As long as you are doubling the number of stitches on each row, it will create the ruffle look. The more rows the fuller it will get. Hi Faye, when you are working in the stitches you are working in both loops. on row 2 after you ch3 do you tr in the same st as ch? Nana, yes, there’s no need to skip any stitches. You don’t pick up any loops when you’re turning. When you turn, you just turn your work 180 degrees so that you can work in the opposite direction. You should only have the loop that’s on your hook when you finished your last stitch on the row. I prefer a “flat piece” to rest around my neck with the spirals cascading down from each side, so I did about 8″/12″ flat (no increases) in the middle of the scarf (use stitch markers to indicate where to place this). Still have the “beauty”, but I think it “rests better” and does keep the neck warmer, while still being “fashionable”. Hi Belle! You can add more rows. The more rows it has the wider the ruffle will be. Thank you for posting this. I made this with no problems..pattern easy to read and easy to crochet! Thanks! !